Place a heatproof bowl over a medium saucepan that is quarter-filled with water. The bowl should fit snugly into the pan without touching the water. Remove the bowl, cover the pan and bring the water to boil over high heat. Uncover and reduce heat to very low so the water is barely simmering. If the water is too hot, the egg yolks will cook too much and the sauce will curdle. Place the egg yolks and water in the heatproof bowl and place over the pan. Use a wire balloon whisk to whisk the mixture constantly for 3 minutes or until it is thick and pale, has doubled in volume and a ribbon trail forms when the whisk is lifted. Add the butter a cube at a time, whisking constantly. It should take about 10 minutes. 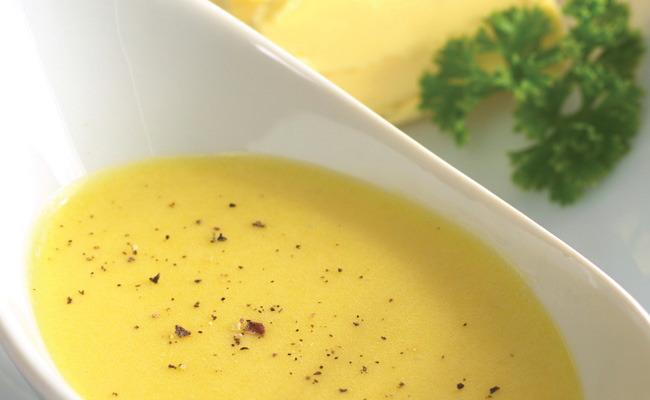 If the butter is added too quickly, it won’t mix easily with the egg yolks or the sauce may lose volume. At the same time, it is important that the butter is at room temperature and added a cube at a time, so that it doesn’t take too long to be incorporated. If the sauce cooks for too long, it can curdle. The sauce will begin to thin when you start adding the butter. However, once the emulsion is established (after about the third cube), it will begin to thicken again. It will continue to thicken as the remaining butter is added. Remove the bowl from the pan and place on a heatproof surface. The cooked sauce should have the consistency of very lightly whisked thickened cream. Whisk in the lemon juice and season with salt and pepper. Pour generously over freshly poached eggs.